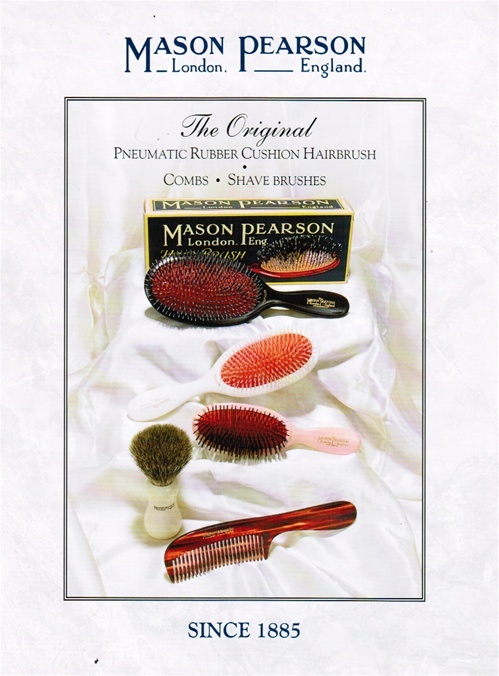 The Original makers of Pneumatic Rubber Cushion Hairbrush, Combs, & Shave Brushes. Regular brushing plays an important part in the condition of your hair. The Mason Pearson Hairbrush cleans the hair, stimulates the scalp increasing the blood flow to the hair roots. A natural contioning oil -sebum- comes from a gland at the base of every hair; brushing spreads it along the length of the hair giving it strength, suppleness and producing a healthy sheen. To maintain the quality of the Mason Pearson Hairbursh it is not mass produced. Most of the work is carried out by hand, using techniques pioneered and patented by the founder - Mason Pearson - over one hundred years ago and improved over succeeding generations. The combs are made by hand using traditional techniques which produce smoothly tapered teeth and rounded tips for more comfort and care. Carmel Drug Store proudly sells the Mason Pearson full product range. Due to the high demand for these products some orders may take more than two weeks to fulfill. Please plan gifts in advance or call to check stock.